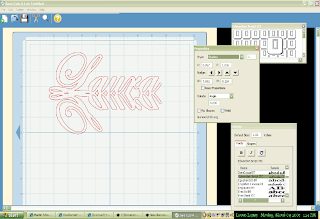 Just wanted to share some ideas on using Inkscape...a free drawing program. You can create a unique design by just typing in your name using a Script font, (the upper script is Edwardian Script ITC, the lower one is Script MT bold,) create a duplicate, flip it and abut it to the first image. If you rotate it clockwise 90 degrees it becomes more of a design element. The middle image combines Laura four times as a border. Try it and have fun! For SCAL users, convert your text with the object to path button so it can recognize it (a few other steps as well but more on that later...on the lighter script I used the shadow style in the properties window set at "1" which adds weight and makes a nice cut. It's a fun way to make a specialized card or message, too!